4 Popular Types of Budgeting: Which System MATCHES You? Struggling with a budget can feel a lot like being in a bad relationship: you invest all this effort, only to still feel unhappy and wonder what’s the point. But what if you just had the wrong partner? Budgeting techniques aren’t one-size-fits-all. The key to budgeting success is finding a budgeting method that jives with you. We’re talking compatibility with your strengths and weaknesses, financial challenges, and money goals if you want this to be long-term. Let us play matchmaker and introduce you to four top budgeting systems to help you choose the best budgeting style for you. SPREAD THE WEALTH! SHARE THIS POST! 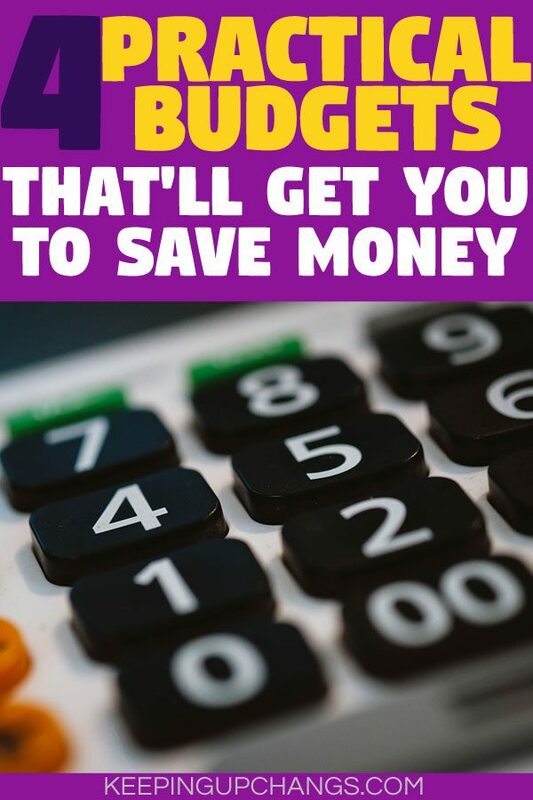 Welcome to The Budget Connection, the show where we help you find the budgeting system of your dreams, so you can be financially happy forever after! Today, we have four contestants vying for your financial affection. Let’s meet them now! So how do I know what will work for me? What if none of these fits me perfectly right? Splitting up your money to go towards your immediate needs, short-term wants, and long-term goals. With this method, most of the legwork comes upfront when you are figuring out how much you are currently spending among the three categories. Once you know, all you have to do is modify your spending until it matches the 50-30-20 percentages. You don’t have to stick to the 50-30-20 breakdown. Don’t feel like you can’t use this method if your needs takes up more than 50%. Adjust the numbers as necessary, but remember that you’ll grow your wealth the fastest whenever you can find ways to cut your needs and wants down to put more towards your savings. This budgeting system provides a clear guideline as to what areas to allocate your money to, without requiring you to account for where every single dollar is spent. This budgeting method is fairly lax and allocates pretty evenly between the wants and savings portions. You’re better off with a different system if you have a specific goal in mind, like blasting yourself out of debt or saving for a house down payment pronto. Steer clear if you are looking for complete direction to help gain control of spending or are in need of a major financial overhaul. Balanced Money Method, if you could have 3 wishes, what would they be? First, I’d want to make sure you’d be taken care of. I’d put about 50% income towards your NEEDS, like a roof over your head and food on the table. Second, what you want is what I want too. I’d give you about 30% income towards buying the WANTS that make you happy. Third, I’d want to have a long future with you. The remaining 20% income would be invested for the years ahead of us, baby. I’m SAVING for our happily ever after together. Of course, if you want to be in it for the long haul like I do, sweetie pie, then I’d love to grow that third number so we can be happy together far into our future. Prioritize saving by setting that money aside first, then use what you have left to pay your bills and have fun. Most budgeting techniques focus on paying your bills first, then trying to save with what you have left over. Reverse budgeting is the exact opposite: save first then pay bills and splurge on extra stuff after. People tend to spend whatever they have available to them. Because this system forces you to immediately put away what you wanted to save, it effectively leaves you with less to spend. As a result, most people naturally adjust to their new, lower disposable income amount. We love this technique, because it allows people to work around a very common weaknesses. This method lets you use your money towards paying down debt or building your savings before you even have the chance to spend it! You’re WAY more likely to succeed if you set up the savings portion to transfer automatically. Out of sight, out of mind means you won’t feel tempted to spend that money you were supposed to save. Whether you want to eliminate debt, save for an emergency fund, or hit another financial target, this system makes you prioritize the goal and aggressively tackle it. Once your funds are put to savings or paying down debt, how you use the remaining money to cover your immediate needs & wants is totally up to you. Just make sure you limit your spending only what you have left in the bank. If you are someone who spends without even knowing what is left in your account, this system can totally backfire on you. Reverse Budgeting Method, do you consider yourself a romantic? If you mean can I prioritize our relationship by working together to paying down debt or saving for our financial future, then, heck yes. But you know what, hon, I see myself as more of an out of sight, out of mind, kinda guy. As in, I get those monthly obligations and long-term goals taken care of ASAP, so I don’t have to be stressing about those money matters. Auto transfers from my account make it a piece of cake. After that, all that’s left is the icing on the cake for you and me to enjoy together. Because you being happy is what matters to me, sugar. 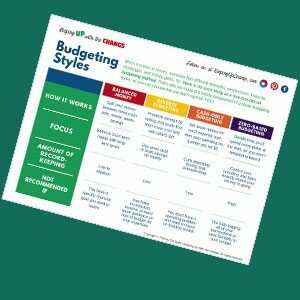 WANT A FREE BUDGETING STYLES PRINTABLE? Go cash-only to see exactly what you have and know exactly when you’ve spent it all, so you don’t go overboard. Also called the cash envelope system. This budgeting technique may seem super old-school, but it still around for a reason: it works! Instead of using debit or credit cards, those who follow this method typically cash out their paycheck and divide the money between envelopes they have for various expense categories: groceries, car-related expenses, clothing, entertainment, and so on. Once they used up all the money, they either just have to give up on buying what they wanted to or use funds from another envelope to get more cash. Handing over your hard-earned cash is a very tangible reminder that you are giving something up when you choose to spend. Some find that the discomforting feeling helps them to curb their spending a little. Plus, when you get to the last bills in your envelope, it definitely makes you think twice about whether you want to buy something now and go the rest of the month without being able to get anything else from that category. Living beyond your means is the single worst money habit to have, which can be easy to do if you tend to treat debit and credit cards like if they are an endless source of money. Overdraft fees and credit card interest can sabotage your finances, but not with this system. If you don’t have any bad spending habits to kick, though, there are other budgeting techniques that can help you build wealth more quickly & efficiently. Balancing the checkbook isn’t necessary, since you won’t need your account to see if there or isn’t any cash available. Because you are dealing with cash, there is no security if you lose or misplace it. Be sure you have a very safe & secure place to keep your cash if you choose this system. Cash-Only Budgeting System, do you live life based on emotions or logic? That depends on the situation, but I do try to keep things simple. The one thing I’ll always think about first is if I have the cold, hard cash for it. Because that kinda matters. If I don’t, then I’ll see if I can get the money from anywhere else or pass until next time. If I do, then I’ll leave the final decision up to you, because the only thing I care about is making sure I can provide for you, sweetheart. Decide beforehand where every single dollar of your paycheck will go, leaving no money mistakes up to chance. Assigning every dollar its job will give you comprehensive guidelines on how you spend money. Having such a detailed budget spells everything out, making you very aware of areas you can cut back on. There is a lot of tracking to make sure you stay within the dollar limits you set for yourself. If the idea of keeping tabs on every financial move you make is a turn-off, skip this method. Assigning every dollar its job will give you total guidance on how to actually spend your money. Having such a detailed budget spells everything out, making it easy to see what areas you spent lots on that you can work on cutting back on. Zero-Based Budgeting System, do you have a lucky number? Well, I’m a huge numbers person, love being very precise about my money, and spending and tracking so that no one dollar gets left behind, so you probably guessed it’s 0. But it’s not. 0 is incomplete. I don’t want my money to make me feel incomplete. My lucky number’s actually 1, because it’s complete in every way. I’ll feel complete when I find The One who gets where I’m coming from with all the detail and structure I provide, and I’ll make them feel complete with the financial security I bring to the table. When I do find that special someone, I’ll make our future together my number 1 priority. Having a hard time picking one? Everyone has different quirks, habits, and weaknesses. Sometimes, you can’t even explain why you do the dumb money-related things you do. But if there is a system that helps you circumvent it, that should be your front-runner. The reality is, habits are super hard to change. It’s pretty easy to figure out what you are supposed to do, but actually doing it is the challenge. No matter how awesome the results are that a budgeting system can create, it doesn’t matter one bit if you can’t follow it. So, be honest with what your weaknesses are and pay special attention to the systems that account for those really well. If you are torn between two systems that seem like they’d work equally well for you, consider what your actual goal at the moment is. Some systems are designed to help you break a bad habit, whereas others are to help you accelerate the growth of your wealth. Choosing a system that targets exactly what you want will help you achieve the goal in the smartest, fastest way. Also, you aren’t locked forever into the system you choose now. As your money skills improve and your goals change, it may make sense to graduate to a different system, which is more than okay. There’s a fifth option besides what we covered above: the do-it-your-way budgeting style. Learning about the major variations in budgeting techniques is good because it gives you options and provides you with rules you can follow, which is super helpful. But, it’s also totally fine to mix and match the aspects that appeal to you, as long as it is helping you achieve your financial goals. For example, let’s say you actually make decent salary but blow it all because you are an impulse spender. Why not combine reverse budgeting, where you set aside a huge chunk for your emergency savings, then use cash-only budgeting to curb your tendency to spend, spend, spend? It’s not like you’re married to any one system at the moment, so don’t hesitate to try different ones out and adjust them until you do find a system that’s perfect for you. Budgeting is useful only if it works. We explain four major types of budgeting methods and who they are best suited for so you can find the right budgeting system for you. Choose the budgeting technique that aligns with your strengths, helps you avoid your weaknesses, and targets the financial goals you are working towards so you can live happily ever after financially.